Home Health News 5 Easy remedies to rid your hair of crawling lice! 5 Easy remedies to rid your hair of crawling lice! Something is definitely crawling in your hair, and the itchiness is so bothersome that it’s driving you up the wall! Apparently your beautiful tresses are now a warm haven for the vile wingless creature, the head lice, scientifically known as Pediculus humanus capitis. These tiny parasitic pests live mainly on the scalp and neck hairs laying their eggs (nits) and feed on your blood. Lice can affect people of all ages irrespective of hygiene level or economic status. It can spread via head to head contact, hairbrushes, combs, clothing, or even bedding. The conventional method of nit picking and lice removal with fine comb is time consuming and extremely painful. Despite the immense effort involved, the process is ineffective because complete removal of the pesky little bugs is difficult. Apart from the constant itching, lice infestations can turn into sores or head scabies through excessive scratching. Fortunately, there is a way to remove lice and nits out of hair for good. We at MedGuru offer some easy remedies to rid your head of these vile creatures. Use a delousing shampoo and leave it in your hair for 10 minutes. After rinsing out the shampoo, douse your hair with a solution of 50% water and 50% white kitchen vinegar. Rub it in vigorously and then wash your hair with water to drive out the odour. This kitchen ingredient works wonders in smothering lice. Apply olive oil close to the scalp and wear a shower cap. Take a shower after a couple of hours, washing hair with regular shampoo. 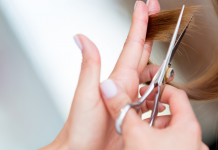 Nits can be removed easily using a comb as the olive oil helps loosen them from the hair shafts. You can eradicate the little buggers while you sleep with mayonnaise. Slather it on liberally on your hair and scalp and put on a shower cap. The lice should be dead by next morning. Just shampoo your hair in a regular manner. Mayonnaise can’t smother louse eggs, so you’ll still nit-pick them by hand. Many people swear by petroleum jelly which can stifle the roaming lice by clogging their breathing holes. Coat the hair and scalp with a thick layer of petroleum jelly and then cover it overnight with a shower cap. Wash out the jelly next morning with your regular shampoo. Repeat the treatment a week later. The remedy maybe effective but it may take a lot of shampooing to get the goo out of your hair! Essential oils not only kill lice they can help ease the itching. Combine 20 drops tea-tree oil, 10 drops rosemary oil and 15 drops of lemon (or thyme) and lavender oil with 4 tablespoons vegetable oil. Rub the mixture into hair, pop on shower cap and shampoo after an hour. Use a nit comb to remove nits and dead lice. A word of caution! Brace yourself for weeks or months of vigilance since lice can reappear due to repeated exposure or a missed nit. The above remedies are all tried and tested to wipe out critters in run-of-the mill cases, but if self-treatment fails, or the skin on the scalp becomes cracked or inflamed, consult a doctor.